What could be better than curling up with a cup of coffee and a great book on a dreary, rainy spring day? How about a home library to catch up on your reading in? Granted, not everyone has an extra room to designate as the “library,” so some may have to have a library that doubles as a home office or other such similar space, but it is still fun to dream about the day that you can have a whole room with tons of shelves stocked with old favorite books, as well as new ones to enjoy! Whether you are in the planning stages or are still dreaming up ideas, below are a few home libraries we recently came across on Houzz that feature stunning designs. You’ll also notice that while some of the libraries take up the entire room, others are simply a corner wall with several shelves and a cozy chair. 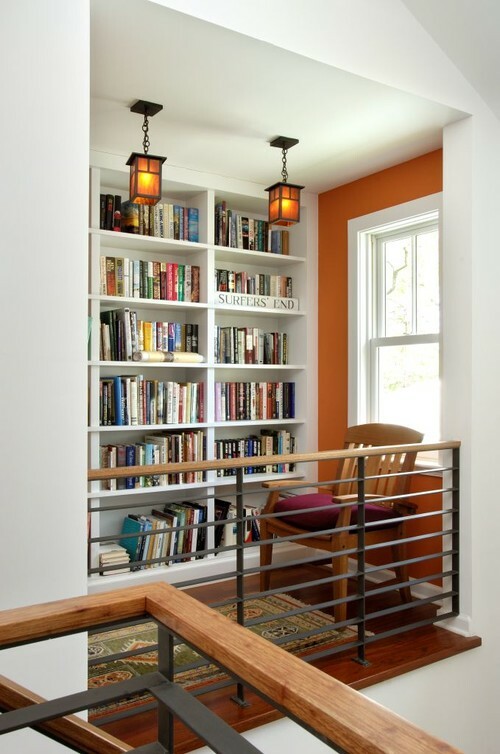 The library in this home keeps everything around eye level (or lower) and has a great openness about it. 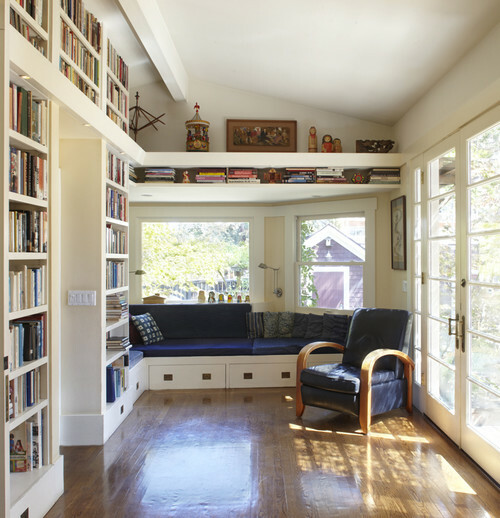 We love the floor to ceiling shelving in this little library, but even more, the comfortable window seat – a perfect spot for reading a book to your children. Isn’t the beach style décor in this library great? It makes for a perfect place to escape the occasional seaside storm with a good read. If you’re tight on space, but still want that library feeling, consider adding some shelves along a hallway – a terrific use of the space you’ve got! What would your home library look like? Do you already have one? Leave a comment and share with us!